DripNet PC™ will deliver precise flow from each emitter in every application including longer runs and undulating fields. It is a true pressure compensating drip tape over a wide range of pressures. DripNet PC™ 15 mil drip tape is durable enough for retrieval and reuse over several seasons. Great in subsurface or surface application. 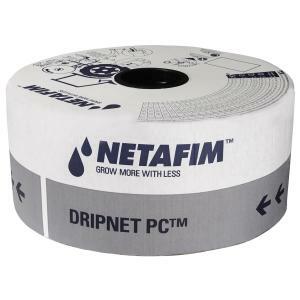 With a variety of emitter spacing and flow rates available, DripNet PC™ drip tape is a great choice for precision watering!